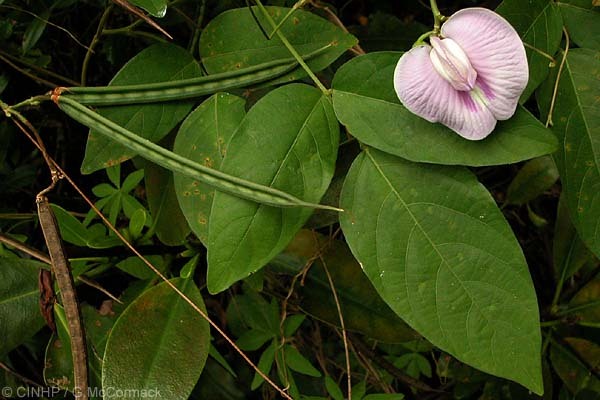 KEY FEATURES: Sprawling or climbing vine with thin fine-furred stems. LEAVES alternate, compound, usually 3 leaflets. LFTS oval, 8x4cm. FLOWERS axillary, small cluster with one open. FL showy, to 4cmØ, purple to very pale purple, with central keel and wide lateral (=wing) petals. FR pod, 15cmx5mm, thick green edges, depressed centre forming pale stripe, terminal spine, splits when ripe. SEEDS ~20, 5x3x2mm, red-borwn with black streaks. NEGATIVE SIGNIFICANCE: Weed - serious. Comments: An increasingly widespread vine in waste and fallow areas. Climbs vigorously on fenses and other plants. Considered to be one of the major weeds of Mangaia, where it is especially abundant and widespread. GENERAL NOTE: Fiji cover crop and fodder (ACSmith).